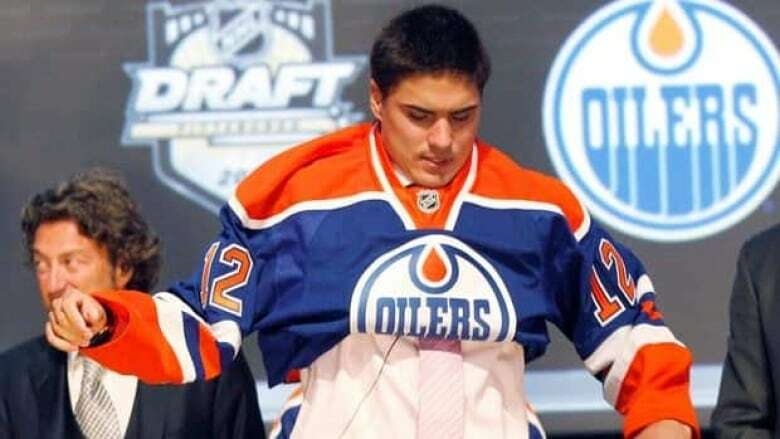 The Edmonton Oilers selected a forward first overall for the third consecutive year, naming Nail Yakupov of the Sarnia Sting at the NHL Draft in Pittsburgh on Friday night. Oilers general manager Steve Tambellini wasted little time once he reached the microphone to end the suspense. The Russian right wing has scored 80 goals and 90 assists in 107 games with Sarnia. He will turn 19 on Oct. 6. The five-foot-10, 189-pound forward suffered a concussion this season after recording 101 points in his rookie campaign with the Sting. At the most recent world championships for Russia, he finished with no goals and nine assists in seven games. Edmonton has chosen first for three consecutive years, with Yakupov following left wing Taylor Hall in 2010 and centre Ryan Nugent-Hopkins last year. Yakupov is the sixth consecutive forward taken first overall in the NHL Draft and the first Russian at the top since Washington selected Alexander Ovechkin in 2004. Oilers head scout Stu MacGregor called Yakupov a "dynamic offensive talent." "Whenever I saw him get in all alone on a goaltender, he didn't miss. He put it in," said MacGregor. "He has the potential — and I want to say potential — to score 30 goals [a season]. Maybe more. You can't win without scoring goals." "He's hungry to perform, he's hungry to score," added GM Steve Tambellini. "He's an emotional player, an explosive player. So for us, trying to think of what that's going to look with Hopkins, Hall, [Jordan] Eberle, [Magnus] Paajarvi, [Ales] Hemsky, [it's] exciting." Not short on confidence, Yakupov said he felt he can help the Oilers right away. "I think yeah, why not?" said Yakupov. "I have lots of time for work in the summer and work with Edmonton, [to] try to make the team. I think I'm ready for the NHL." Said MacGregor: "I'm not going to put that kind of pressure on him." The Columbus Blue Jackets stepped up to the microphone next, taking defenceman Ryan Murray with the second pick. The six-foot, 201-pound Murray ranked second among North American-based skaters behind Yakupov and is arguably the most NHL-ready player in the draft. A solid all-around defenceman with the Everett Silvertips of the Western Hockey League, Murray had 31 points (9-22) in 46 games during a season where missed time with a high ankle sprain. Murray also represented Canada at the IIHF World Hockey Championship in Finland, becoming the second-youngest player ever to wear the Maple Leaf at the tournament. "I was pretty nervous before the draft. It seemed like I was in the building for about an hour but it felt like a day," said Murray. The Montreal Canadiens did not opt for the blue-line, choosing centre Alex Galchenyuk, Yakupov's teammate at Sarnia. The Milwaukee-born forward — his father was playing minor league hockey for the AHL Admirals — said all the right things before a media throng. He's proud to wear the Habs jersey and plans to add French to his linguistic arsenal of English, Russian and Italian. Galchenyuk suffered a knee injury in the pre-season but returned with two games remaining. "We did our homework," Trevor Timmins, the Canadiens' director of procurement and player development, said of the injury. The six-foot, 198-pound Galchenyuk played just eight games this season but finished second in OHL scoring in 2010-11 behind Yakupov with 83 points (31-52). The New York Islanders went next and took defenceman Griffin Reinhart of the WHL's Edmonton Oil Kings. The six-foot-four, 207-pound Reinhart had 12 goals in 58 games this season and is the son of former NHLer Paul Reinhart. The Toronto Maple Leafs then took Morgan Rielly at No. 5. The six-foot, 190-pound defenceman missed most of the 2011-12 season with the WHL's Moose Jaw Warriors because a torn ACL, but still collected 18 points (3-15) in 18 games. In 2010-11, Rielly led Moose Jaw in rookie scoring and was second among defencemen with 28 points (6-22-28) in 65 games. The Winnipeg Jets were the fourth Canadian team to pick in the top-10, selecting defenceman Jacob Trouba of the U.S. national team development program at No. 9. Calgary traded the 14th pick to Buffalo for the 21st and 42nd picks. The Sabres used that selection to draft centre Zemgus Girgensons of Dubuque of the USHL, having taken Mikhail Grigorenko of the Quebec Remparts two picks earlier. The Ottawa Senators made a popular pick in the nation's capital at No. 15, taking defenceman Cody Ceci of the OHL's Ottawa 67's. Ceci is also from Ottawa. The Flames would pick at 21, taking Quebec high school centre Mark Jankowski. Vancouver was the final Canadian team to select, tabbing centre Brendan Gaunce of the OHL's Belleville Bulls at No. 26. Thirteen defenceman in all went in the first round, with two goalies picked: Tampa Bay took Russian goalie Andrei Vasilevski 19th, while Belleville goalie Malcolm Subban, the younger brother of Habs defenceman P.K. Subban, went 24th to the Boston Bruins. Rounds two through seven take place on the weekend.